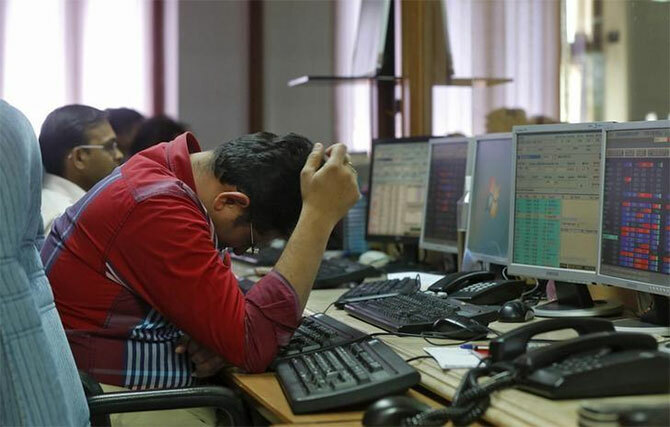 Rediff.com » Business » Market crash: Worried about your MF investments? After five years of outperformance, mid- and small-cap funds have taken a sharp hit this year. Year-to-date (YTD) these funds are down 12.08 per cent on an average. The large-cap universe is doing better: The Nifty 50 index is flat with a YTD return of 0.55 per cent. However, the average YTD return of actively-managed large-cap funds is -4.33 per cent. In other words, most large-cap active funds are currently underperforming their benchmarks. More specifically, of the 54 unique actively-managed funds in the large-cap category, 41, or almost 76 per cent funds are underperforming their benchmark. If amid the general gloom in the market (due to the sharp correction in the mid- and small-cap universe), you are worried about the performance of your large-cap holdings as well, you should not. Investors need to understand that bouts of underperformance by funds are more common than one realises. This should not be a cause for worry because there could be certain specific conditions due to which a large part of the large-cap universe of funds is underperforming. One reason could be that a few specific stocks or sectors are driving the markets up. Those funds that are not overweight on these stocks and sectors will not be able to outperform their benchmarks. This is precisely what is happening currently. A few select IT stocks, some private banking and pharma stocks are driving the large-cap rally. First, each investor should check the performance of his fund to see if it is actually underperforming its benchmark YTD or over the one-year horizon. Next, look at the longer-term performance of your fund over the three-year, five-year and even 10-year horizons. In all probability, you will find that your large-cap fund has comfortably outperformed the benchmark over the longer time frame. Over the five-year horizon, for instance, 58 per cent of large-cap funds are currently outperforming their benchmarks. This should provide relief to investors. What really matters for them is how their fund does over the longer time period. If there is outperformance over the long term, then short-term underperformance should not be a cause for concern. There will always be periods of short-term divergence. And while you should take note of these bouts of underperformance, they should not be cause for panic. If the period of underperformance continues for some time, many investors then begin to think of stopping their systematic investment plans (SIPs) in these funds. This should be avoided because doing so will prevent the investor from achieving his financial goals. There will be tough periods in equity investing, but investors should not stop their SIP investments under any circumstance. Often, investors become dissatisfied with the performance of an asset class because they make the wrong comparisons. There is a tendency among a lot of investors to mix asset classes and then compare their performance according to their convenience. For instance, if the equity markets are witnessing a period of weak performance, then they will compare equity returns with that of fixed deposit, and regret having invested in them. In such times, they conveniently forget that equities have the potential to fetch much higher returns over the long term. Investors must understand that when they compare mutual fund returns with another investment or with a benchmark, then the comparison has to be an appropriate one. A stock cannot be compared to a mutual fund as the latter is a portfolio while the former is a single holding. Similarly, there is no point in comparing the returns of a large-cap fund with that of a fixed-income instrument. The money allocated to a certain asset class should not suddenly be switched to another asset just because the latter is doing relatively better. An individual's asset allocation is decided based on her/his goals, her/his time horizon, and so on, and this needs to be adhered to during the ups and downs in the market. A lot of investors also have the tendency to keep taking some action within their portfolios on a regular basis. They feel that this is the best way to earn returns. Once an investment is made, especially in an equity-linked instrument, then it should be given sufficient time -- at least five to seven years -- to show its mettle. Just because a fund has shown underperformance in a one-year period does not mean that it should be dumped. Many investors are trigger happy and quick to change their investments. They jump from a fund that is underperforming to another that is performing well currently. Such a move often backfires. After the investor enters the new fund, it often happens that its hot streak ends and it starts underperforming. On the other hand, the fund that he discarded recently now begins to gather steam and perform well. This is the reason why there has to be a period of around three years, or even a full up and down cycle, before one decides that a fund has not been doing well and should be changed. The reason for underperformance should be carefully examined. It should be something to do with the fund and its management. Don't dump a fund just because the overall market conditions are adverse and your fund's performance too has declined during this period. Arnav Pandya is a certified financial planner.